Cheryl Marcos was born and raised in Honolulu, Hawaii. She attended and graduated from Saint Francis High School. She later graduated from Hawaii Pacific University with a Bachelor’s degree in Travel Industry Management. In 2004, she moved to San Diego to work at hotels in various management positions. She was first hired by the Four Seasons Reservations Department and later by the Marriot Catering Department. Though her educational background, pleasant demeanor, and fluent Tagalog language skills elevated her quickly in management positions, she missed Hawaii and her family. 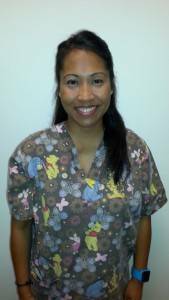 In early 2013, she moved back to Hawaii and accepted a position as an optometric technician with Hawaii Vision Associates. In 2014, Cheryl became the office manager of Hawaii Vision Associates’ newest office-Pearlridge Sears Optical. Taking on a management position can be difficult. Managing a new office can be daunting. However, Cheryl exceeded all expectations. With her intelligence, caring personality, and ability to maintain composure under challenging situations, she has made the pearlridge location thrive. Cheryl is one of Hawaii Vision Associates hardest working family members. Not only does she maintain the pearlridge office singlehandedly, but she also has a second job. She sells monogrammed handcrafted items by Thirty-One Gifts, LLC. Her tireless work ethic is truly admirable and never overlooked. In her free time, she enjoys spending time with her daughter. For information regarding our Pearlridge Sears Optical locations, please contact Cheryl Marcos: cheryl@hawaiivisionassociates.com.